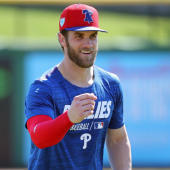 The Phillies optioned Pivetta to Triple-A Lehigh Valley on Wednesday, Matt Gelb of The Athletic reports. Few players have seen their fantasy stock plummet in the past month as much as Pivetta, one of the trendier wide-awake sleepers heading into draft season. Though he scooped up his second win in Tuesday's 14-3 decimation of the Mets, Pivetta recorded more walks (three) than strikeouts (two) and fell short of a quality start for the fourth time in as many turns. Philadelphia will turn to the recently recalled Jerad Eickhoff as its fifth starter while Pivetta looks to right the ship in the minors after submitting a 8.35 ERA and 2.13 WHIP in 18.1 innings with the big club.